The wind energy sector between vision and reality: Manufacturers present their service and maintenance concepts for offshore wind farms on the high seas. Which concept will win out in the long term is uncertain. Will we even see new islands built in the North Sea? + + + + Operation and maintenance of offshore wind farms "There will be no one-size-fits-all solution"
Colin Morgan, Director of GL Garrad Hassan’s offshore wind energy section based in the UK, expects offshore o&m to be a future billion-euro business and an industry of its own. But the way there will be rocky: Past experiences have sometimes been frustrating. And how will the future fleet of rib boats, helicopters, hotel boats and crane vessels in the European North Sea be co-ordinated in order to increase energy production at minimum cost? 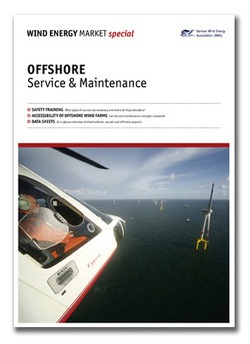 Dozens of different ships and platforms are in operation during the construction and maintenance of offshore wind farms. Co-ordinating this multitude is a tough job for project managers. At the same time the sector urgently needs specialized ships. Repower has big plans. The Hamburg-based manufacturer is keen to become one of a handful of service providers capable of offering service and maintenance for large offshore wind farms. Upscaling is the order of the day: The first ship is set to be ready by 2013. The increasing distance from the mainland increases the complexity of personnel and materials logistics. Concepts in the sector markedly differ. Which mode of transport is chosen depends on the weather, on working hours, and the possibilities of housing staff on site at the wind farms. Condition Monitoring systems still depend on well-trained technicians to correctly interpret the data they generate. Fully automated analysis is still way in the future. How do service engineers safely reach offshore wind turbines when the sea is rough? Some operators rely on helicopters. Others favour specialized ships. Ship- or turbine-based access systems are also on the market. So far, no solution has become a clear favourite, and standards are not in sight. Experts soon expect a dozen competitors to be ready with their own offshore turbines. The market is set to move towards ten-megawatt turbines, direct drives and floating foundations. So far, however, six manufacturers still share the offshore market amongst themselves. An increasing number of companies are gearing up to offer safety training for future offshore personnel. So far, uniform standards are lacking. In spring 2010 wpd and the Schrammgroup founded the independent service provider “All for Offshore”. Although turbine manufacturers have so far done their own servicing and maintenance, the workload is such that they can no longer cope alone. + + + + Interview: Assistance with maritime planning "Run through every single move"
Marine Surveyor Jürgen Mackeprang of Kapitän Möller & Partner advises planners and operators of offshore wind farms. He explains what has to be taken into account when building at sea, what his advice consists of and why it is advisable to include classification societies early in the process. + + + + Wind forecasts A good forecast makes for better operation Knowing where and when the wind blows helps operators to plan repairs and operate their offshore turbines with greater precision and less wear. Also, precise wind measurement is the only way of establishing whether a turbine delivers what the manufacturer has promised.